One thing that I love about fall is being able to break out the crock pot and make some delicious stews, soups, and chili. 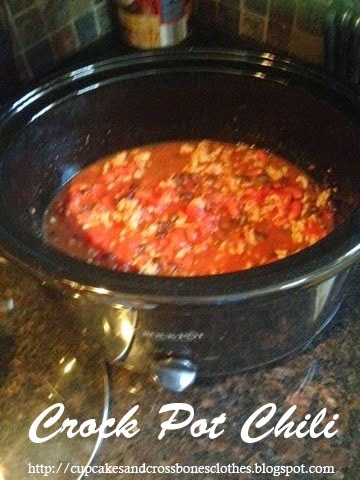 Here is a super easy chili recipe that is perfect for those cold fall nights. Just prep it the day before and start cookin in the morning so that when you get home from work you have a yummy hot meal waiting for you. Saute onions in a skillet until soft and translucent. Next add your ground beef and allow it to brown. Drain once all your meat is brown and no longer pink. Mix all ingredients except the cornstarch and the water into your crock pot. Cover your mixture and cook it on low heat for about 6-7 hours. Turn heat up and mix in your cornstarch and water until smooth and add it to the chili mixture. Uncover your crock pot and cook for about 15 minutes longer until it begins to thicken. Top with cheese and/or sour cream. Are you a chili fan? This recipe sounds so delicious! I love crockpot meals in the fall/winter. I love being able to break out the crockpot. Chili is really amazing in the Fall, this is making me hungry. Chili is def one of my favorite fall meals!